A corroding stanchion. Note the exfoliating steel. 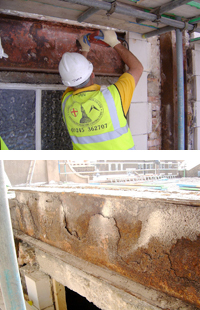 A defective stone and residues having been removed, the steel is thoroughly cleaned and prepared and then coated with our zinc rich protective system. Most multi-story commercial stone buildings constructed from the end of the 19th century, incorporated steel within the masonry façade. Until the implementation of modern ‘rain-screen’ cladding, the walls were generally solid, comprising of stone, bonded to a brick or blockwork substrate and all contained within a steel frame. Many of these early steel framed buildings are now showing signs of corrosion. 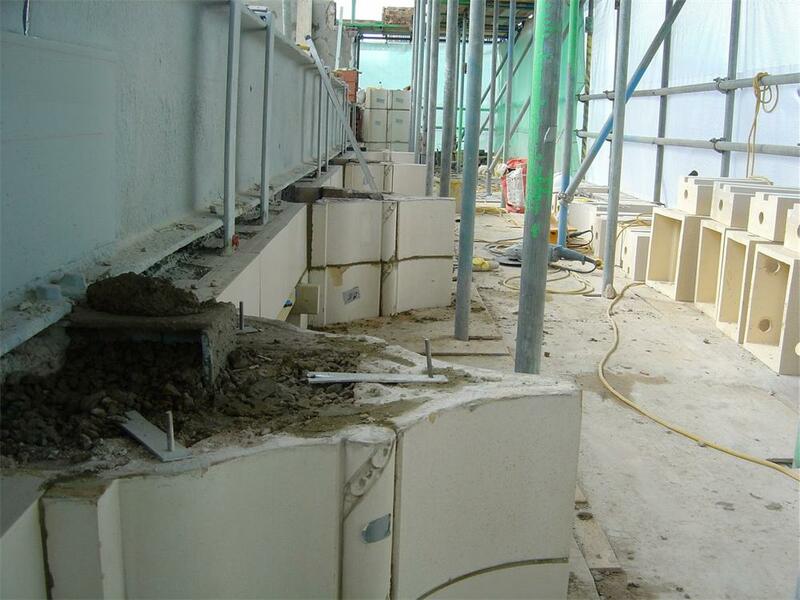 Stonwork is not flexible and will subsequently fail if the corrosion is not stopped. The early steel frames were not encased in concrete, which may have prevented early corrosion. In addition, these early steel framed buildings were designed with no means to accommodate thermal movement. Irrespective of the original cause, once the steel corrodes, the forces exerted on the masonry by the expanding iron oxide residues are enormous. This will result in the cracking or disruption of areas of stone exposed to the elements. 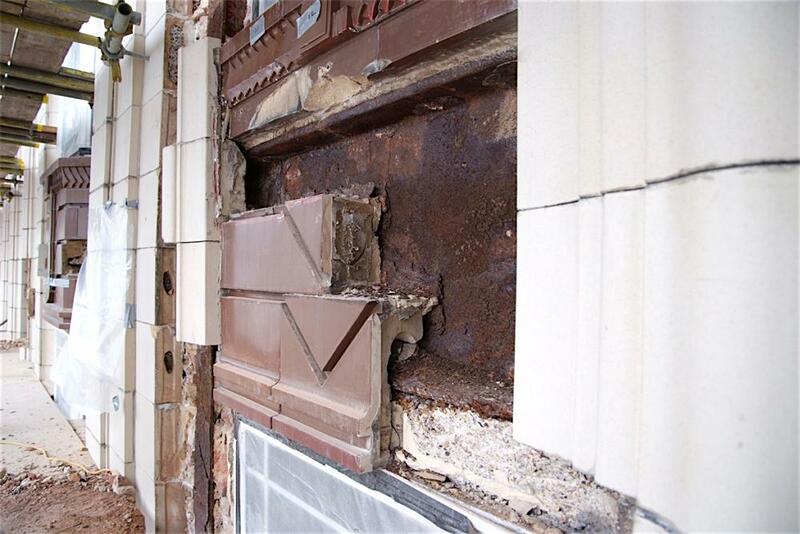 The process of deterioration is now assured and the cracks will now provide a passage for the ingress of more rainwater thereby exasperating the problem. 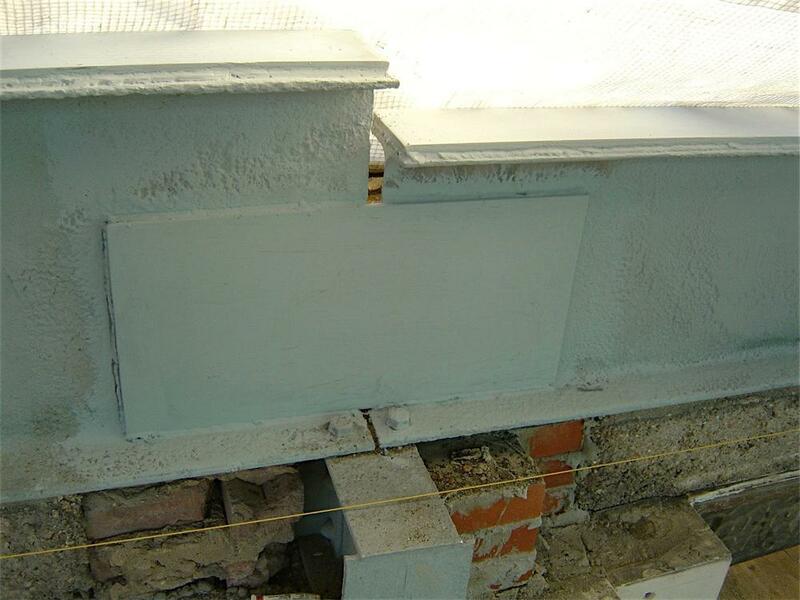 Whether or not corroded steel exposed during a restoration project can be fully encased in concrete, London Restoration have developed a cold galvanizing system, which results when cured, to at least a 95% deposition of pure zinc onto the steel. Where this is coupled with the recommended preparatory works and the correct blast profile is achieved, the protective system should be effective for in excess of 50 years. 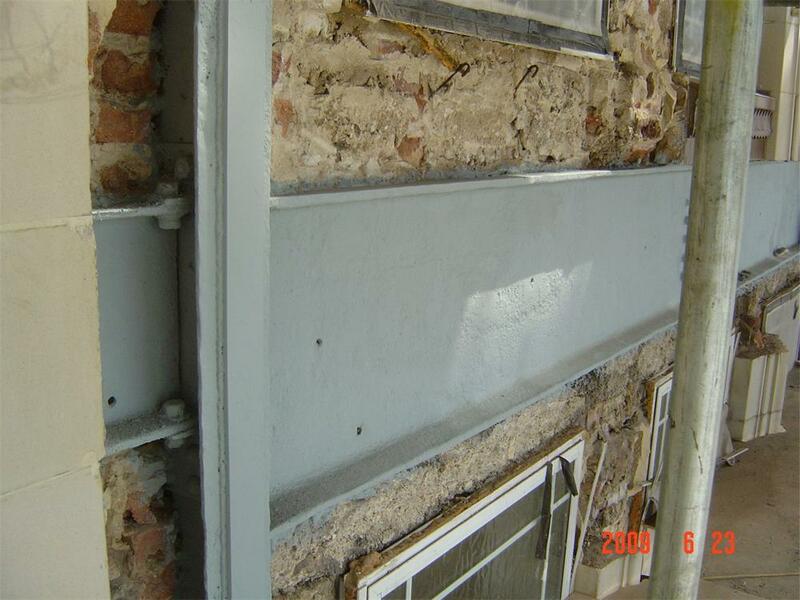 The above steel beam has probably corroded excessively due to its proximity to the flat roof. The asphalt roof upstand to the parapet (now removed ) had remained defective for many years all due to lack of maintenance. This led to an inordinate level of water penetration with ensuing results. 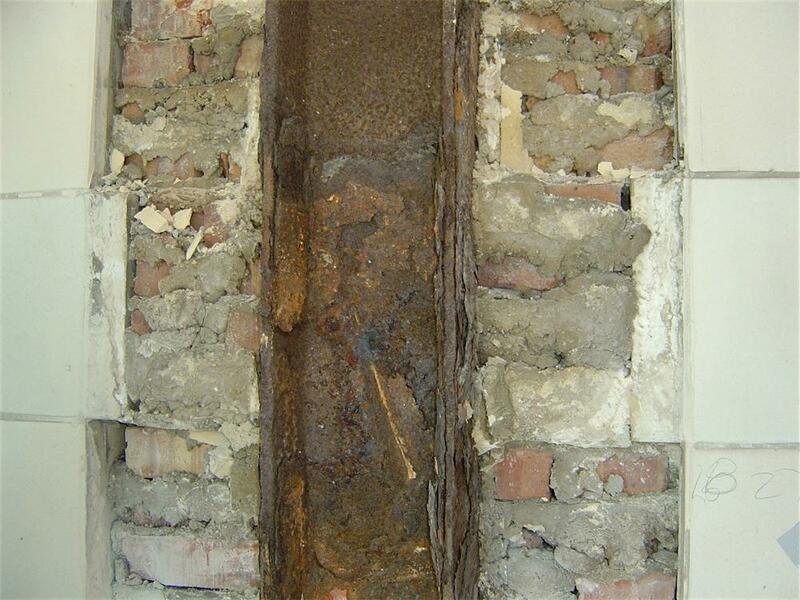 The corrosion to this beam had proved detrimental to its anticipated working load. 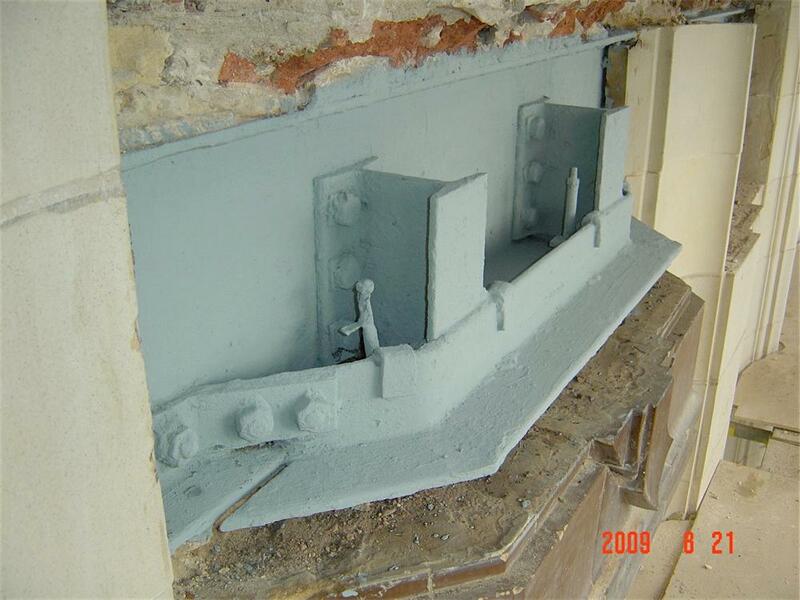 In order to maintain its assessed working load of about 65% of its yield load, the parapet was reduced in height and the top flange and web was plated with 15 mm welded steel plates.